On Sunday, December 9th at 3:00 film historian and pianist, Ben Model, will show, discuss and accompany some short silent films. 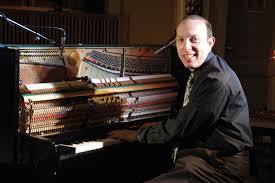 BEN MODEL is one of the nation’s leading silent film accompanists, and performs on both piano and theatre organ. Ben works full-time presenting and accompanying silent films in a wide variety of venues around the USA and internationally, carrying on a tradition he learned from silent film organist Lee Erwin (1919-2000). Over the past 30+ years Ben has created and performed live scores for several hundred silent films, films lasting anywhere from one minute to five hours. Ben is a resident film accompanist at the Museum of Modern Art (NY) and at the Library of Congress’ Packard Campus Theatre, and performs at theatres, museums, schools and other venues around the US and internationally. He is a renowned accompanist, film producer and has composed and recorded multiple scores. He is a visiting professor of film studies at Wesleyan University.